This bizarrely named game is actually a vertically scrolling shooter like Raiden or The Reap, and which was made using the MUGEN system, an engine designed for fighting games. It is however a superb example of the genre and really showcases what the engine can do when turned to other uses, making it a perfect treat for genre fans. In most respects, the game is nothing particularly original, offering the usual science fiction setting as an excuse for the player to wreak all sorts of interplanetary havoc in the name of saving the universe. 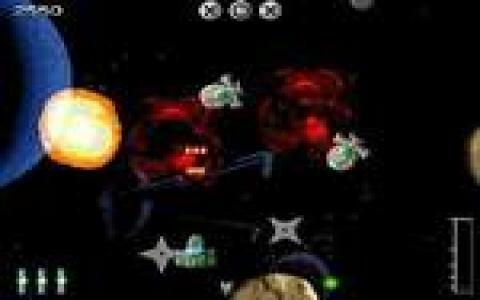 This is done in traditional fashion, with four levels of intense space-based combat against a variety of alien craft but one thing which does mark the game out a little is its powerup system. As usual, there are some nifty weapons to play around with, but instead of collecting these in linear fashion, you instead pick up capsules, which then float around your craft. The trick is that different combinations of capsule yield different weapons, so the fun comes from experimenting and remembering your favourites. Visually, the game is something of a mixed bag, lacking in the personality and character of the best shooters like the supremely distinctive R-Type or Forgotten Worlds but with some amazing screen-filling explosions that really bring home the visceral thrills. Sound on the other hand is superb, with fantastic effects and tunes that are extremely memorable and which rank up with the best, such as the Robocop theme. There might not be anything particularly new about J-Dar-II but it does what it set out to do, which is provide a heap of fast action entertainment, and for this it should be applauded.